Mornings can be hectic and rushed whether you’re a mom or not, and it’s easy to skip the most important meal of the day. These healthy breakfast bars are super easy to grab while you run out the door or scarf down while you’re breastfeeding your baby, or if you have more time you can enjoy one of my new favourite breakfasts by adding chia pudding and fruit, check out the full recipe here. The great thing about these breakfast bars is that they’re packed with lots of lactation boosting ingredients like oats, brewers yeast, apricots, and almonds. They also have lots of protein with the quinoa and nuts to help power you through your day. 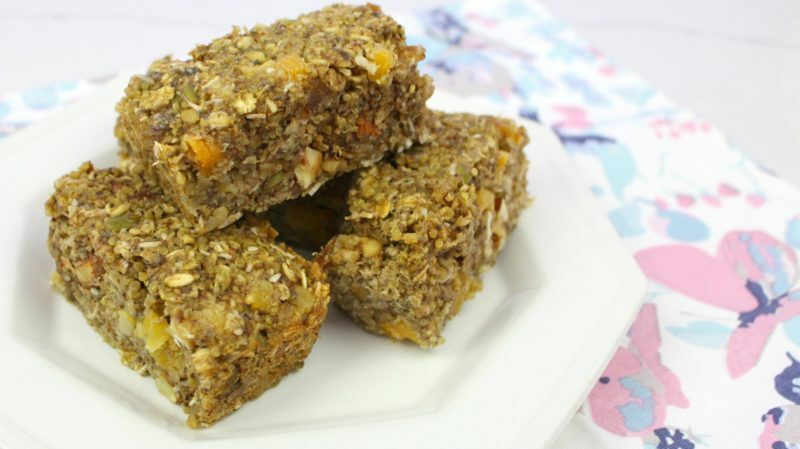 If you’re not a breastfeeding mama you can skip the brewers yeast and enjoy the delicious taste of these healthy breakfast bars. Add even more goodness with some chia pudding packed with omega-3’s, fiber, and iron, and some fruit or berries. Preheat oven to 350 and cook quinoa according to package directions. Mix dry ingredients in a bowl: oats, flax, baking soda, salt, spelt, cinnamon, brewers yeast, nuts, dried fruit, and coconut. Mix wet ingredients in a separate bowl: cooked quinoa, syrup, agave, vanilla, applesauce, and water. Mix dry ingredients into wet ingredients, and pour into a 9 x 9 baking pan. Cook for 20 - 30 minutes. Cool in pan and cut into bars.